I’m back, still breathing, after an unplanned two-week hiatus. During this vacation from blogging I spent a whirlwind couple of days in San Francisco, ushering out Cocktail Week at Absinthe and sitting (briefly) at Neyah White‘s bar at Nopa, and then spent the rest of the time diving headlong into the freelance life. But now that my Sitemeter readings are starting to free fall, and after receiving a “Dude, What’s up?” e-mail from a reader wondering if I’d abandoned this thing (thanks for checking in, Joseph), I felt the need to get my act together for a few minutes and post about something worthwhile. Like this: If you’re at all familiar with the cocktail blogosphere, you’re certainly aware of LUPEC-Boston. Now, the ladies of LUPEC-B have taken their cocktail wisdom to the print shop, and the result is the Little Black Book of Cocktails, a slim but serious volume with recipes for a selection of vintage and contemporary libations, and photos of the LUPEC-B ladies by Matt Demers. I finally got my hands on a copy of the LBBoC, and I have to say what a fine job they’ve done. The book has recipes ranging from old favorites like the Monkey Gland to new favorites (around here, at least) such as the Jaguar, and after wandering through the pages I don’t see a bummer in the bunch. 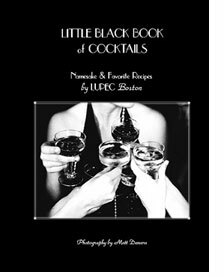 Buy a copy from the LUPEC-Boston site, and you’ll be rewarded not only with this well-considered cocktail guide, but with the knowledge that the proceeds are going to the Friends Boutique at the Dana-Farber Cancer Institute. Reading the book also made me finally get around to mixing a drink I’d been planning to try for quite a while. While Ted Haigh addressed this in an issue of Imbibe and Erik covered it during his recent stroll through Savoy’s H’s, I’ve sadly been behind in my consumption of Hanky Pankys. But, with the LUPEC book in hand and a bottle of Fernet Branca staring at me from the liquor cabinet, I thought it finally time for a dalliance with Ada Coleman’s creation. Chin chin — and buy the book. Stir well with ice and strain into chilled cocktail glass. Squeeze a piece of orange peel on top. Yay, Paul’s not quite dead yet! Glad you enjoyed the Hanky Panky. A fine, fine drink. There’s another very enjoyable Fernet cocktail coming up shortly to kick off the letter “I”. I knew you’d made it home safe after San Francisco, but I thought maybe the life of leisure had gotten the better of you. Great to see you back! ?? Many thanks for the kind review, Mr. Clarke! Glad to see you back among the writing. And congrats on the career move! Glad to know you’re back with us! I had my first Hanky Panky a few weeks ago and it made me a Fernet believer. A fine drink, indeed. Aw shucks, Paul. Are you trying to make all of us over here in Boston blush? Thanks so much for your kind words and your support of LUPEC Beantown. We love our cocktails almost as much as we love raising money for amazing organizations. Let’s all toast to drinking for a cause! Hi Paul- Thanks for reminding me of Absinthe, a friend took me there the last time I was in SF. I just had a few cosmos when I was there but this makes me think I should have been a bit more imaginative. The ‘Little Black Book of Cocktails’ looks like a good place to start. I love the cover, it’s very elegant (unlike my summer wardrobe, which, admittedly, is needing some work). Can’t wait to discover more here. I need to get those cocktails skills up.